Liao Yiwu’s book, God Is Red, is one of the best I have ever read. Liao Yiwu’s work concerning Tian’anmen Square cost him 4-years in prison. His work with the currently imprisoned Nobel prize winner, Liu Xiaobo, caused further restrictions on his freedom in China and led to regular visits from the police. He was told that the publishing of God is Red would be considered a criminal offense. On July 2nd, 2011, he crossed the border into Vietnam, knowing that he would have to sacrifice his connection with his homeland in order to tell the stories of the people who lived there. It started a few years earlier while Liao was working on other projects. He met a number of Chinese Christians and became interested in their various histories. Even though he was not a Christian himself, Liao became intrigued by the parallels he saw between the past repression of religious peoples in the 60’s and the ongoing human rights abuses in the present.Through his contacts he met believers in rural Yunnan, Beijing, and Chengdu, and the resulting book exposes past abuses and uncovers incredible stories of faith, strength, and integrity. Liao’s style is somewhat unique; he interviews 18 Chinese Christians, and then adds his own short introduction of the person and tacks on follow-up information. This approach allows him to give a voice to those who may otherwise not be heard, and helps coax stories from those who would otherwise remain silent (Liao used the same method in his highly praised book, The Corpse Walker). The majority of this book focuses on the question “How did Christianity (and Christians) survive the Cultural Revolution?” Many of the interviewees knew other believers who were executed by blood thirsty mobs and government officials trying to fill execution quotas. They endured harsh physical labor and public scorn for a God they had only recently come to know. Whether or not you are religious, I think it would be hard not to admire the integrity of these early Christians. I found inspiration every time I opened this book. The story of the Blind Musician in Chengdu was one that stuck out in particular to me. As a child, this individual slowly lost his sight and the Chinese doctors were unable to diagnose the problem. His parents and grandparents became convinced that it was simply his destiny, but a missionary doctor prescribed the child a medicine that started to restore his sight. Unfortunately for the boy, the Communists had just ordered the foreigners to leave the country, and the boy’s sight faded once again to complete darkness. His vision was never restored, but he never forgot the healing the missionary had brought. One of the minor stories that appears throughout the book that I think is important to highlight, is that many of the mission cemeteries were destroyed during the Cultural Revolution. From other sources, I know that the large mission cemetery in Nanjing was also desecrated during this time (one of the hospital’s founders was buried there). It is painful and embarrassing for the local gov’t to tell foreign families, whose relatives sacrificed much of their lives for the poor of China, that we do not know what happened to the remains of their loved ones. Sadly, the gov’t continues to allow these resting places to be plundered and destroyed, but foreign churches are struggling to protect these memories. The only thing I would have liked to have seen in this book would be accounts from members of the churches that joined the Three-Self Patriotic Movement. As it stands, the book gives the impression that the groups that didn’t join suffered disproportionately compared to other Christians in China, or that those who joined did it out of cowardice and fear. I know from Chinese friends, that all Christians shared in misfortune during the Cultural Revolution. To the Red Guard it didn’t matter which church you went to, you believed in something mightier than Chairman Mao. 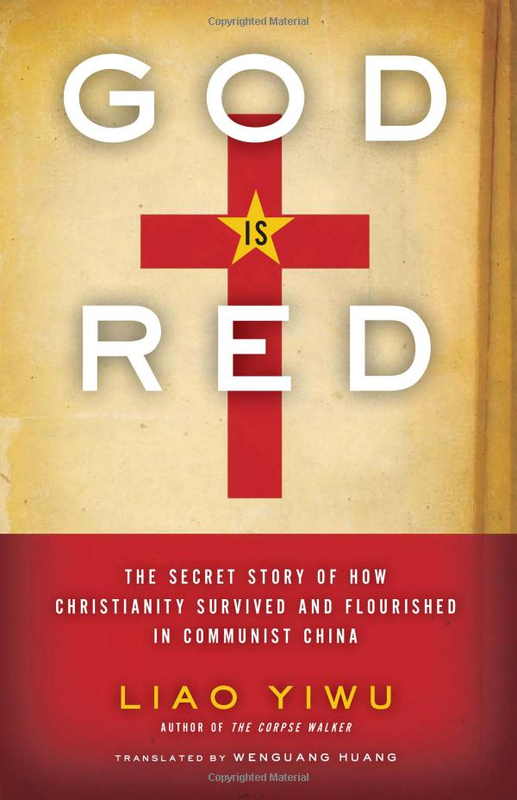 I highly recommend God Is Red ($12.99 Kindle, $16.25 hardcover) not only for those interested in the continuing story of Christianity in China, but also for those interested in learning, from a variety of sources, more about one of modern China’s darkest periods. (I’ve also given this book as a gift, and urged friends and visitors to read this prior to visiting me). By T in Uncategorized on February 28, 2012 . Thanks for the tip, Tom. I’m going to buy the Kindle version now. The only church I visited in China was BICF. Since it was for foreigners, we weren’t allowed to bring locals to the service; they checked for foreign IDs at the door. The rules are the same for all ICF (international Christian fellowships), this is because they are run by foreign ministers. I think this ends up giving many visitors the impression that religion is far more regulated than it may actually be. I hope the next time you’re in Beijing you make your way to one of the TSPM churches, which offers a very different experience, and illustrates the growth of Christianity in China. I don’t recommend foreigners to visit house churches because their presence could cause unwanted attention from the authorities. I agree with Tom about the danger of visiting house groups, but consider it a real shame. I’ve been to several (confident my presence posed no safety concerns for a variety of reasons I won’t divulge) and they contain some of the most amazing, sincere, and dedicated people I’ve ever met. Anywhere. I hope people note the primary endorsement on the back cover. The Christianity-connection is one of the most underreported/overlooked aspects of the Chinese human rights struggle, imo. Not that it would really benefit anyone involved to highlight that. Just bought it, thanks for the tip. Should we introduce you as a Christian when publishing the Chinese version of your post? Sure. I am a Christian, but that isn’t the only reason I liked this book. Thanks for the book review! I bought & read it last week and it’s quite an interesting and inspiring read.